Then-Father Paul Etienne was shocked on Oct. 5 when Archbishop Pietro Sambi, apostolic nuncio to the United States, called to tell him that Pope Benedict XVI had selected him as the next bishop of Cheyenne, Wyo. He had no idea that this appointment was coming because the process by which bishops are chosen is marked by strict confidentiality—and for several good reasons. Canon 377 of the Code of Canon Law stipulates that, at least once every three years, the bishops of an ecclesiastical province must submit to the apostolic nuncio a list of priests who, in their opinion, are qualified to be bishops. An ecclesiastical province is made up of the dioceses in a geographical area where an archdiocese also exists. For example, all the dioceses of Indiana make up the Metropolitan Province of Indianapolis. This same canon also states that individual bishops can recommend potential bishops to the nuncio at any time. Canon 378 lists the requirements for potential bishops. They must be “outstanding in solid faith, good morals, piety, zeal for souls, wisdom, prudence and human virtues.” They also must be at least 35 years of age and been ordained a priest for at least five years. The canon recommends, but does not absolutely require, that potential bishops have a doctorate or licentiate in Sacred Scripture, theology or canon law from a university approved by the Holy See. 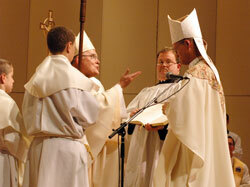 Since becoming a bishop in 1987, Archbishop Daniel M. Buechlein has participated in this process several times. According to Father James Bonke, defender of the bond in the archdiocesan Metropolitan Tribunal, when a diocese no longer has a bishop—either because the bishop has died, resigned or been transferred—the nuncio begins a process of assembling a list of three recommendations, known as a “ternus,” to succeed that bishop. “Those three names have to be ranked in order according to his preference,” Father Bonke said. 30 to 40 written evaluations of each of the recommended potential bishops. The ternus, along with the evaluations, is forwarded to the Holy See’s Congregation for Bishops in Rome. Archbishop Buechlein discussed being asked to assess potential bishops. “When the papal nuncio seeks information and judgment concerning a particular candidate, the process becomes more focused. So does one’s prayer and responsibility,” Archbishop Buechlein said. “Candidates proposed for nomination to the office of bishop may or may not be from the Metropolitan Province of Indianapolis. For thorough investigation, the nuncio ‘throws the net wide’ at times. The bishops and cardinals who are members of the various congregations at the Vatican—such as the Congregation for the Causes of the Saints or the Congregation of the Doctrine of the Faith—meet only a few times a year at most. The CNS article explained that the Congregation of Bishops ordinarily meets every two weeks for an entire morning at a time. Members of the congregation receive “extensive documentation” on each episcopal candidate to review in advance of the meeting. American members of the Congregation of Bishops are cardinals Bernard F. Law, Justin F. Rigali and J. Francis Stafford and Archbishop Raymond L. Burke. Much of the paperwork on episcopal candidates that the congregation’s members receive is made up of the evaluations gathered by nuncios. When asked to evaluate potential bishops, they are told that their answers and the name of the person they have been asked to assess is to remain strictly confidential. “Their responses are supposed to be top secret, equal to the seal of confession,” Father Bonke said. “It is done so in order to ensure the protection of the objectivity and integrity of the process,” said Archbishop Buechlein. “It is also kept confidential out of sensitivity for the potential candidate being considered. The process of gathering evaluations of potential bishops and assembling a list of three recommendations is not specifically laid out in the Code of Canon Law, but is a procedure established by the Congregation for Bishops. Although a nuncio and his staff will have done much work to assemble the ternus, the Congregation for Bishops or the pope himself may reject all three recommendations. Then the nuncio may have to start work on a new ternus. But if one of the recommendations is accepted first by the members of the Congregation for Bishops and then by the pope, then the nuncio must pick up his phone and make that fateful call to the man chosen to become a bishop.